I had an awesome Christmas holiday, I hope you did too! I was thoroughly tired out and frustrated from all the last minute shopping, the cooking, the decorating, the wrapping, but when all was said and done and I was in the company of family, all was good! Troy, the boys and I spent the morning like we always do, opening presents and then I made a big breakfast and prepared for our trek to my in-laws' for Christmas dinner. I loved watching the boys' expressions as they opened their gifts. Donovan was not too thrilled with the clothes, but he loved his programmable robot, dinosaur castle, and all the other toys Mommy, Daddy, and Santa bought him. Xander is so infatuated with Mickey Mouse, Spongebob, and Elmo, so of course Santa hooked him up! When he looked under the tree, first thing he saw was "Mih Mou" (Mickey Mouse)!! Of course, before starting anything, we all wished Jesus a happy birthday. When we arrived at my mother in laws', it was like Christmas all over again. Donovan and Xander had big sacks of toys and clothes and Donovan got the much anticipated Wii! That made his day because that was the main thing on his list. My sisters, niece, and nephews came up to my house for our Day After Christmas celebration. It was a little chaotic, but fun. We exchanged gifts, laughs and enjoyed some delicious Italian food prepared by my sister and I (chicken parm, beef and spinach filled stuffed shells, BBQ meatballs, veggie and regular lasagna, sauteed spinach, and a salad...YUMMY). I ended up with 2 visa cards, gift cards to Macy's, AC Moore, the movies, amazon.com, and Applebee's, a digital photo key chain, flannel pajama pants, scrap goodies, a necklace...can't wait to go shopping!! 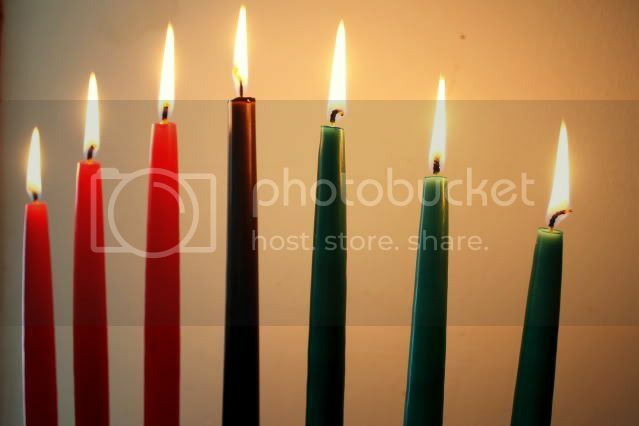 Today is the second day of Kwanzaa, Kujichagulia (self determination). 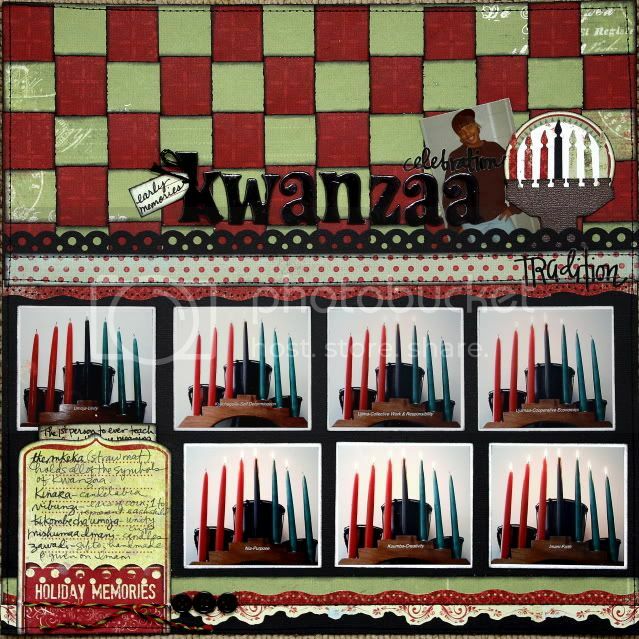 I have 2 projects to share; the first one is a Kwanzaa layout that I was asked to create for My Mind's Eye's blog. 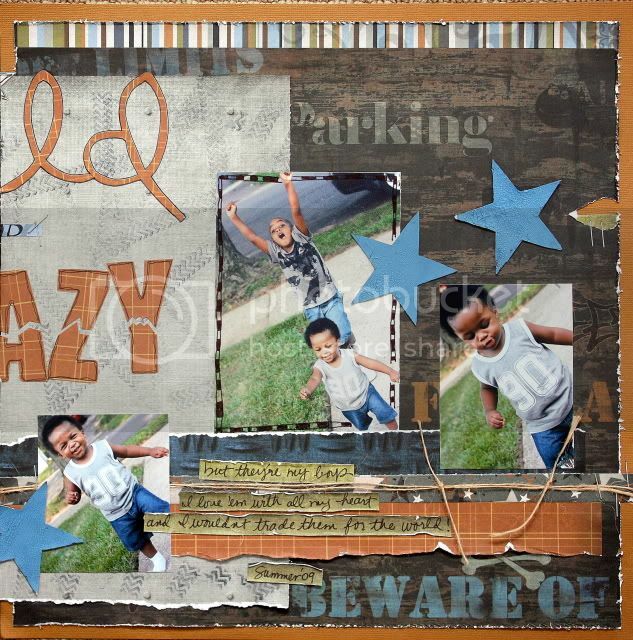 If you go to the blog, you can download step by step directions to re-create this layout. 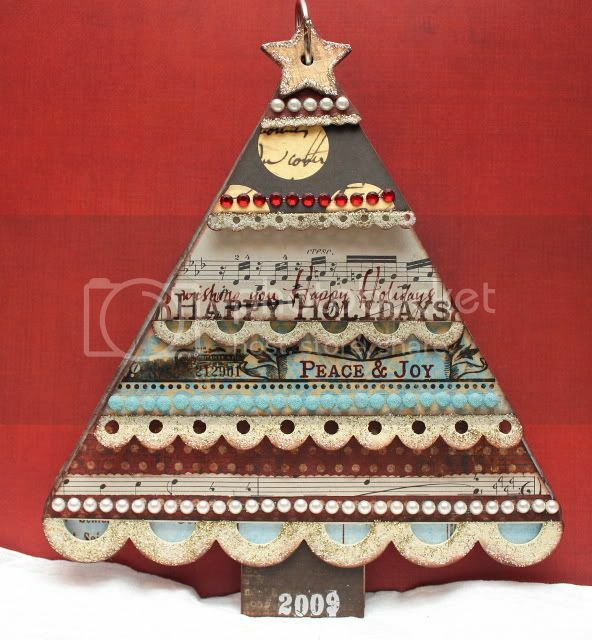 This layout, "Kwanzaa Celebration" features MME's The Merry Days of Christmas line. I started by weaving red and green papers to mimic the mkeka, the straw mat that holds all of the Kwanzaa symbols. I hand cut the kinara and used a Martha Stewart punch for the candles. I took pictures of my kinara lit for each of the 7 days of Kwanzaa; before printing them out, I typed the Swahili name for each day and it's meaning across the kinara. I was asked to include a childhood picture of myself on the layout if at all possible. 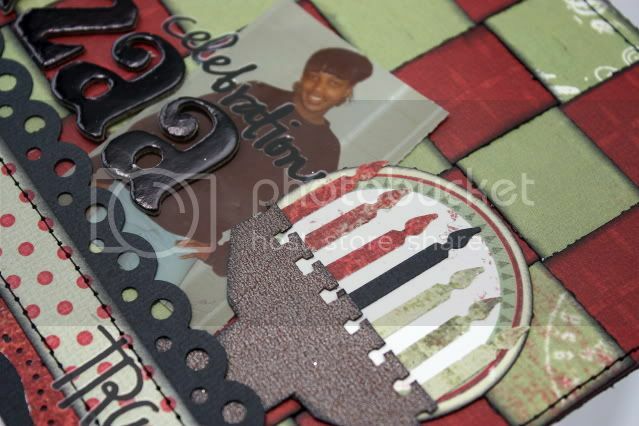 I didn't start celebrating Kwanzaa until I was 18, so I dug up a picture from that year and added it to the layout. I think this was the last year that I rocked a bang! LOL! I braided red, black, and green floss together for an added special touch. I created a pocket out of the journaling tag--on the outside, I wrote the meanings of all the Kwanzaa symbols. 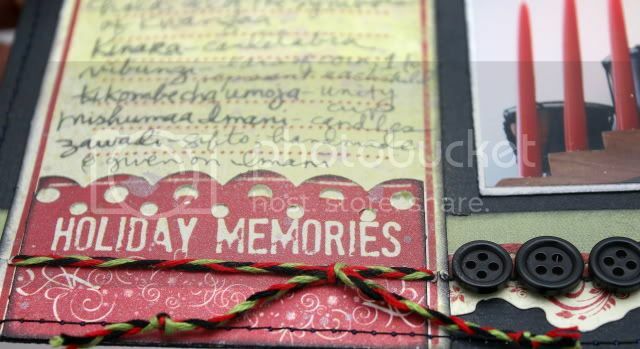 I then journalled my early memories of celebrating Kwanzaa on a tag and tucked it in the pocket. This next project was created for Purple Cows. You can download step by step instructions from the blog. 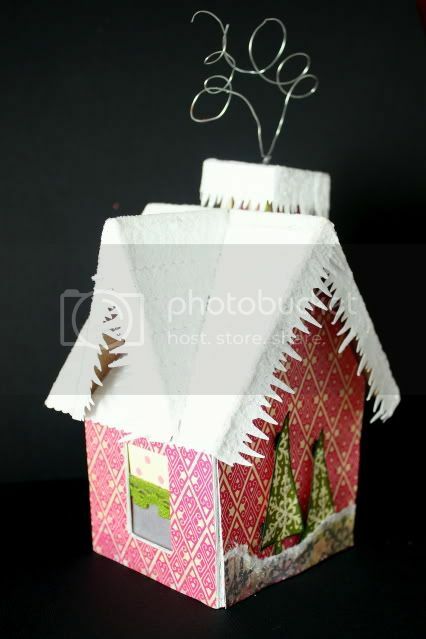 I had way too much fun creating this little house...as a matter of fact, I have 2 more...I think I feel a village coming soon! 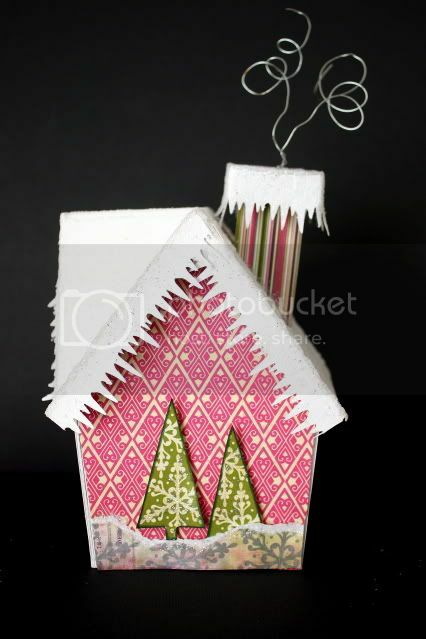 I came across these "Iddie Biddie chipboard houses" while at this past CHA summer. Their booth was right across My Little Shoebox's booth--we had the opportunity to speak with the owner and she gave us a sample to try out. 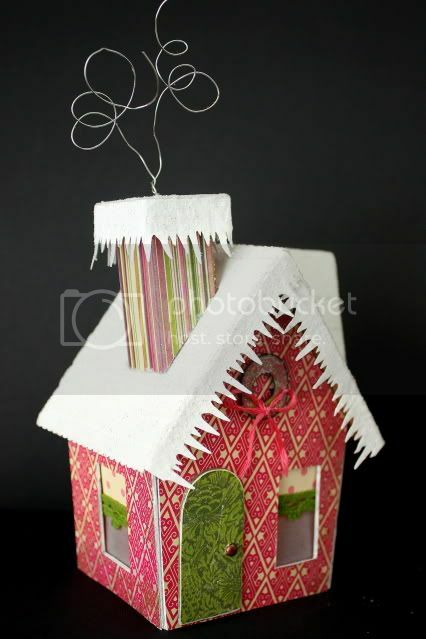 These little houses are addictive! I used Purple Cows #1040 2-in-1 trimmer and designer blade #2812 to create the shingles along with partner product from clearsnaps, glue arts. Here you can get a better look at the singles cut with Purple Cows' designer blade. 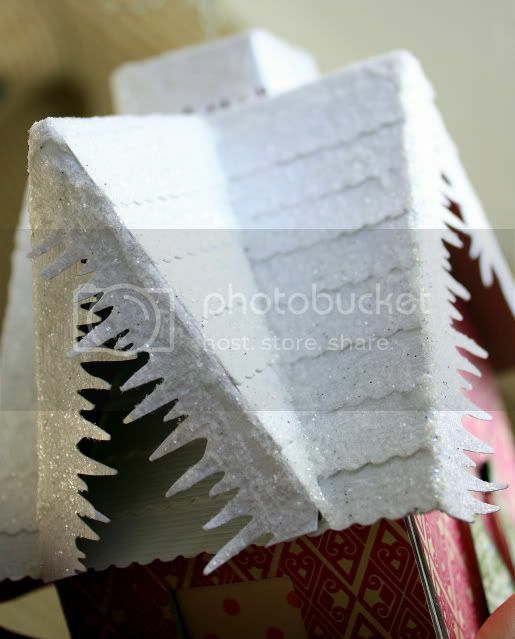 The entire roof is covered in Pink Paislee's coconut pixie stix glitter mixed with a sprinkle of silver glitter. Thanks for stopping by...Happy holidays!!! I have a few fun projects to share with you today. They were all created using In Bloom by My Little Shoebox. This line is so whimsical you can't help but take a creative leap outside of the box! 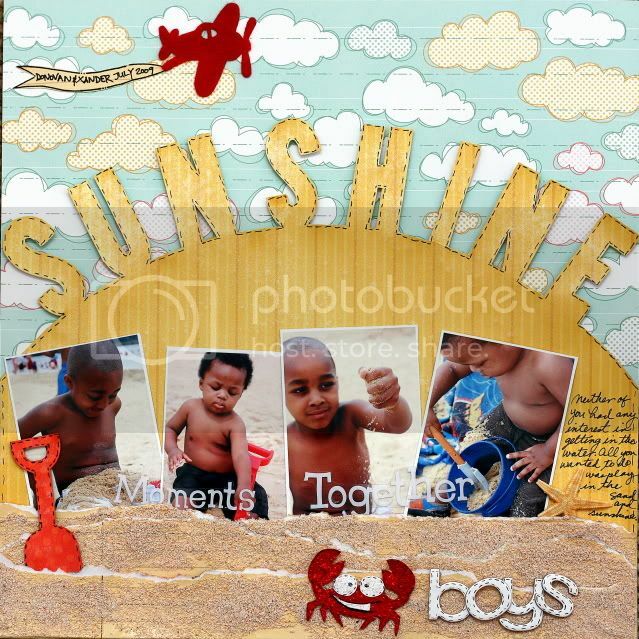 This layout titled "Sunshine Boys" is probably my fave! I designed it to look like a beach scene; I even used real sand. The boys and I went on a field trip to the lake with Xander's daycare this past Summer. Neither of them had any interest in getting in the water...Xander even cried when I tried to put him in. They were just content with playing in the sand. 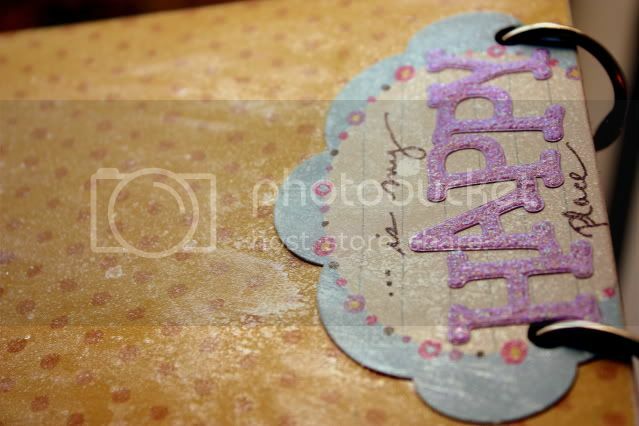 I adhered the 1st part of the title with foam squares so that I stood up from the background a bit. The sand is from a beach in Bermuda. My mom collected some for me and I decided to put it to use. 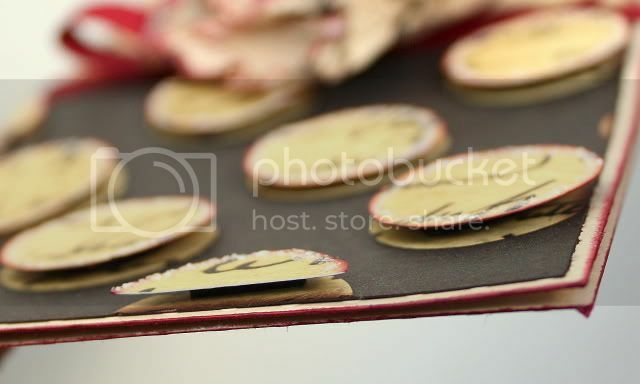 I tore 3 strips of line paper from this collection, fovered them with wet adhesive the covered with sand. 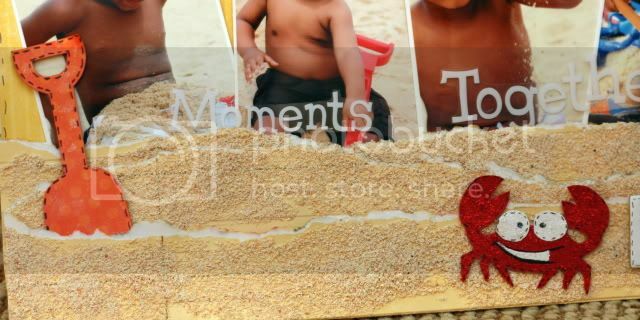 I tapped off the excess sand and sprayed them with Creative Imagination's super seal to stop the sand from falling off. I drew the shovel by hand, traced the crab on cardstock and pieced it together. 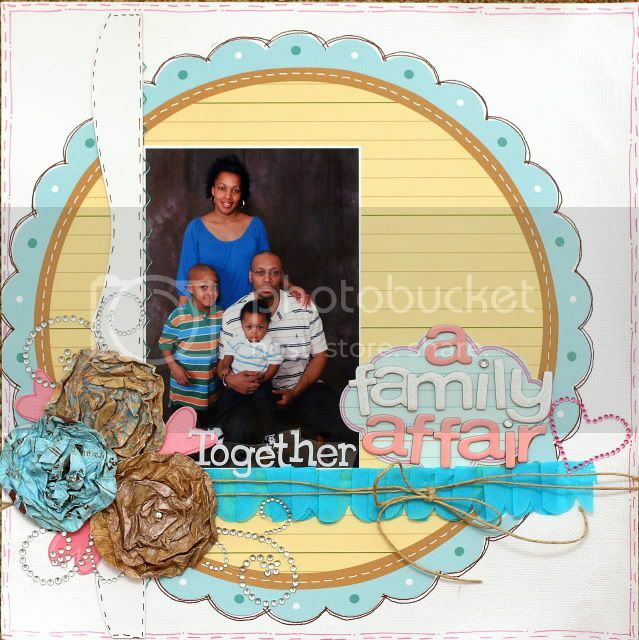 This is a quick layout featuring another photo from our family photo shoot. Here's the story behind this photo. I got a little creative with the mittens here. The "fur" cuffs are actually clouds that I cut from patterned paper. Thanks for taking a peek, have a wonderful week! Congratulations LaMaMaLa!!! You've won a blingalicious RAK from me! Please email me your address at tanisharenee74@hotmail.com and I will get it out to you ASAP!!! OK, even as I type this blog post, I am still in shock!!! I am bursting at the seams and couldn't wait to share this with you! I HAVE BEEN ASKED TO JOIN CREATIVE IMAGINATIONS DESIGN TEAM!!!! I know...exciting right?! Creative Imaginations!!! I had the pleasure of meeting DT Coordinator, Cheryl Mezzetti on the scrapbooking cruise to Bermuda. I have been a fan of hers for a while and couldn't wait to take her classes on the ship. Being asked to be a part of CI's team is beyond my wildest dream! I am looking forward to designing with the team and coming up with some fab projects with CI's products!! My latest project is up on Purple Cow's blog. 'Tis the season for eating lots of good comfort food, hosting holiday parties and sharing recipes. 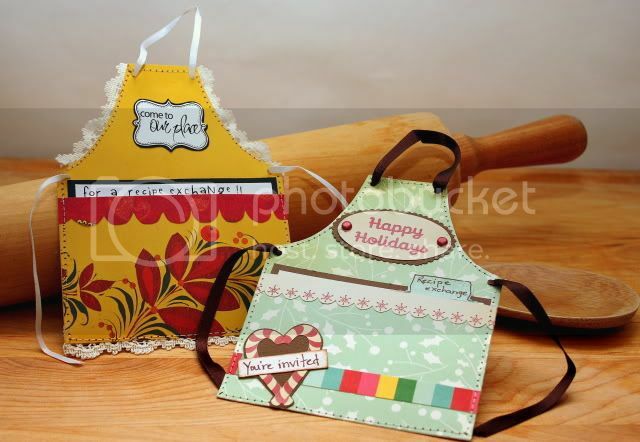 Imagine how excited your guests would be about coming to your event if they received one of these darling little apron shaped recipe exchange invitations in the mail! They are easy and super fun to make. You dress them up to cater to your style...use gingham papers and lace and you'll have an old-fashioned apron, used lots of colorful papers and you'll have a cute, funky apron. Most of all...have fun! Well...I guess since we're on the brink of a new year, it's only natural that changes are going to occur. Although I am looking forward to what the future holds, I am also sad to see a few things go. First of all, one of my favorite online scrappy places is closing at the end of the month. I have been a member of scrap-diner since September 2007. I have served as a Guest Designer and Design Team Member for the site, gained a ton of inspiration, and loved chatting there. It was my daily hangout spot in cyberspace, but sadly Sher has decided to close and concentrate on her family. I certainly understand, but I'll miss those crazy ladies and I'm sad to see it go! Secondly, DreamGirls Challenge blog has closed...again for family reasons. I love having had the opportunity to design for this challenge blog since the beginning! Such a talented group of women...I wish them all the best of everything! Thirdly, I am stepping down from Shimmerz Education Team. This was an incredibly difficult decision; as you may know from visiting my blog, I loved being on this team and I truly believe in the product. The DT and EdT are truly amazing designers and I will miss working beside them. Life is funny...just when you are happily traveling one path, another one appears and you have a decision to make...well, I have been presented with an amazing opportunity (one that I'll reveal here later). I felt that although I was happy on my path, I would kick myself if I didn't travel the other one. I wish everyone at Shimmerz all the best!! 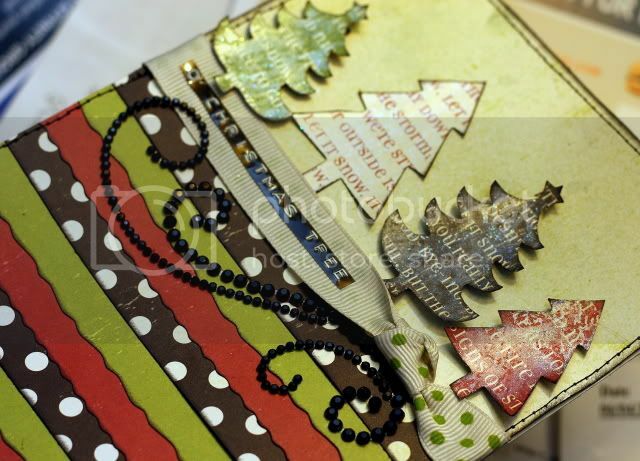 By the way, did you see their feature on Scrapbook Trends' Blog? I was so happy to see that ST picked one of my projects to showcase! I cut apart all of the pieces, traced them onto cardstock and patterned paper and then pieced them back together...Watermelon Martini anyone? I sprayed the glass with baby's breath spritz and then swiped under the sea blingz across it. 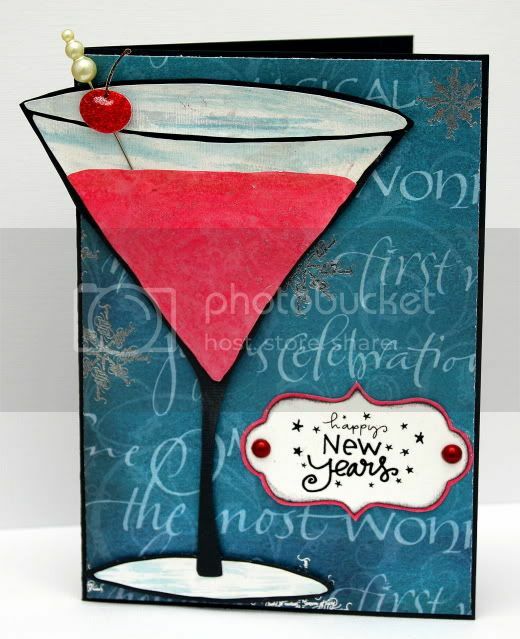 I painted the "drink" part with hottie pink blingz and used the same colors on the journaling spot. I loved the way this turned out! Hey there!! Welcome to Purple Cow's Holiday Blog Hop! If you've hopped here from Samantha's fabulous blog, then you are well on your way and have been treated to some wonderful eye candy from our terrific DT members!! If you just happened to pop in on my blog, join us...I guarantee you'll have a great time. Just go back Purple Cows' blog and start from there. Be sure to leave comments on each blog and make it all the way to the end of the hop for a chance to win RAKs and an awesome prize from Purple Cows!!! Wouldn't that be a nice little treat? 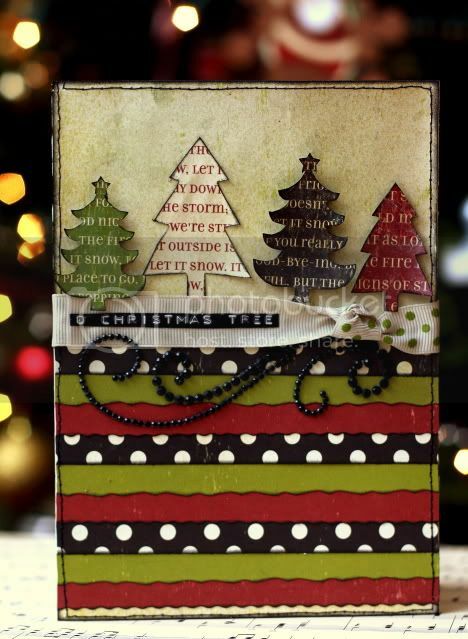 I used Purple Cows 2-in-1 Trimmer along with designer blades 2801, 2803, 2810, and 2811 and Making Memories Mistletoe line to create this Christmas card. It was very simple to make! 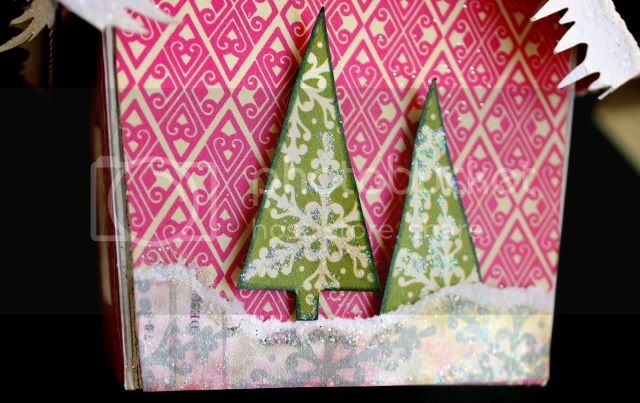 I just cut strips of patterned paper using the different blades and layered them along the bottom of the card. I spritzed the top portion with Olive Branch Shimmerz Spritz, cut the trees from patterned paper, painted them with Pixie Dust Blingz and adhered with foam adhesive. 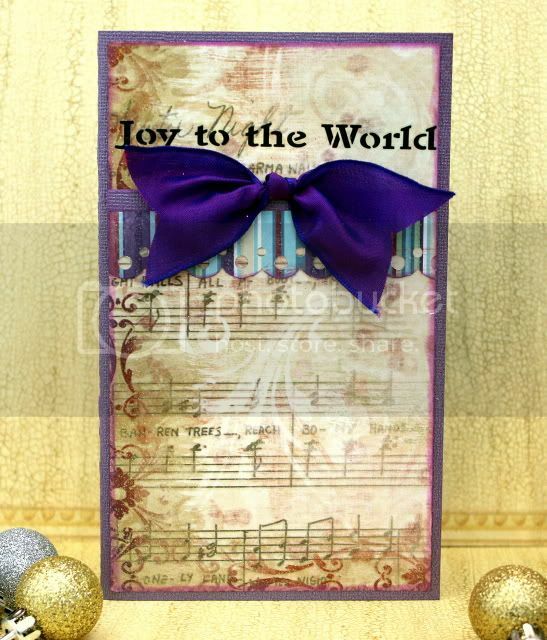 I added a few little embellishments and now I have a great accompaniment to any gift or cute a gift card holder! 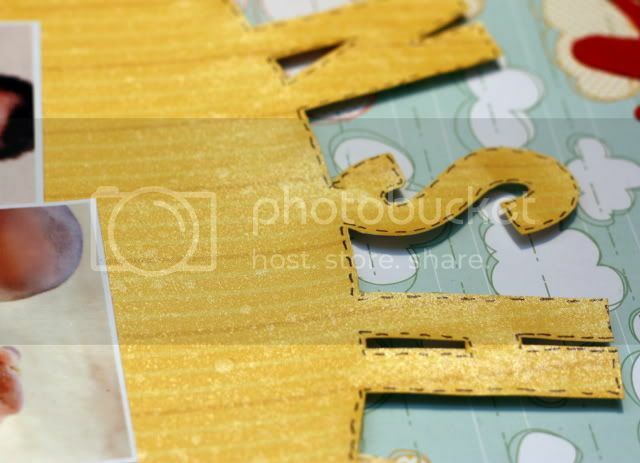 Here's a close-up of the different borders and the bling. Anyone who leaves a comment on this post between now and Sunday 12/20/09 at 11:59 EST, will be eligible to win a blingalicious RAK from me! Who doesn't like bling? Now it's time to hop on over to Vicki's awesome blog! Have fun and good luck...but before you go, make sure to check out Purple Cows design contest. There are only a few days left to get those entries in. Remember, there's $9000 in prizes up for grabs! You could give your scrap room a makeover with all that loot!! You can't win if you don't enter...so go ahead and enter! My new project with complete directions is up on Purple Cows' blog. You can check it out here. 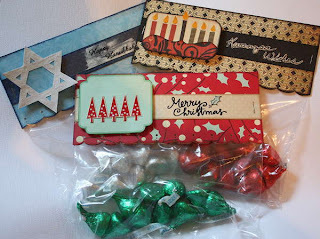 These are quick and easy treat bag toppers that you can personalize for any occasion and make to fit any size bag. I used Purple Cows 2 in 1 trimmer, along with partner product from Cosmo Cricket, Dove of The East, Clearsnap, Hambly, and Bazzill. Don't forget, there are still a little over 2 weeks to enter Purple Cows' design contest. They are giving away $9000 in product! Click here for more information and don't forget to mention that Tanisha sent you! Enjoy the rest of the weekend...thanks for taking a peek! 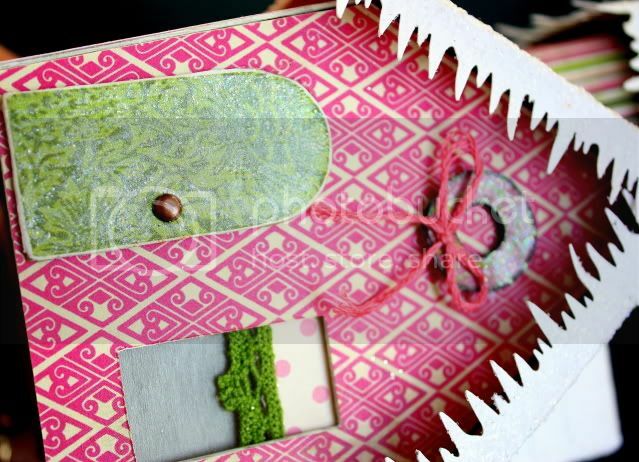 I'm wrapping up the last of my My Little Shoebox projects for this month. 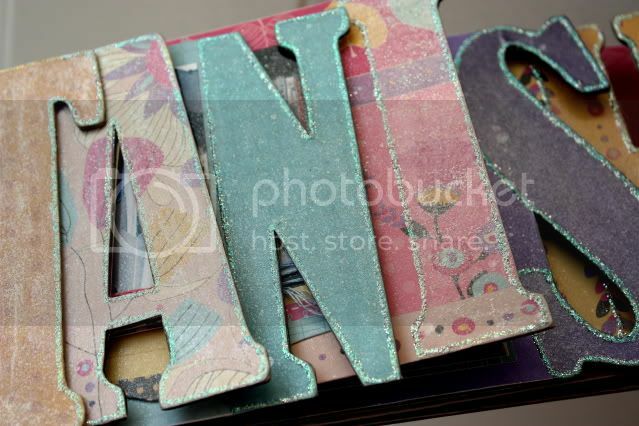 Check out this uber cool name album! 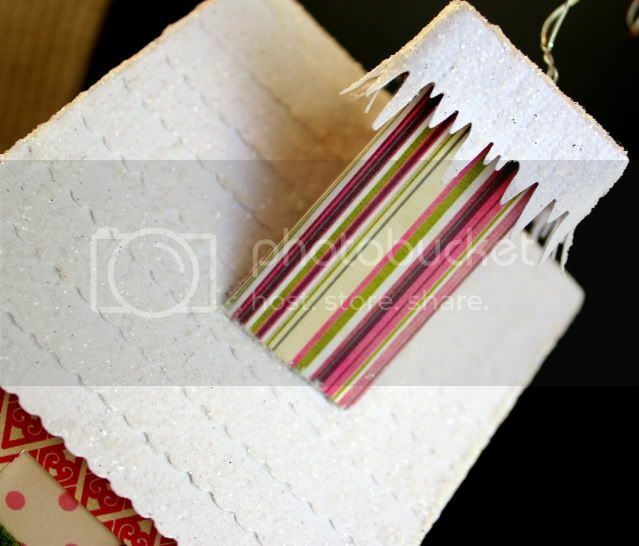 This month, the design team had a fun time decorating personalized chipboard albums from Clear Scraps and experimenting with Shimmerz products!! I've created a name album before, so I went a different route with this one. Instead of the book being about me, I made it about my scrap space. I came up with words/phrases that began with each letter of my name. For instance, the "N" is for novelty and new supplies and the "H" is for heirloom and hopelessly addicted. I took photos of some of my favorite things in my area to add in the book. The front cover reads, "my scrappy place" and the back cover reads "...is my happy place". Here, you can get a better look at all of the shimmerzy goodness. I painted each letter with shimmerz and blingz and then outlined with stickles. I then spritzed the front and back covers with Baby's Breath Shimmerz Spritz. Every once in a while, I take inventory of my scrap stuff to see what needs to be used and what I could use more of (as if I really need more stuff). Well, I noticed that I had become quite a Basic Grey collector. I love their papers, but I've been buying and buying and haven't used them for a while. I looked at the photos that were sitting on my desk and decided to crack open the pack of June Bug papers that had been sitting unopened since the summer. Here's what I came up with! How lucky am I to have captured this picture of Xander barking at a dog at the park? Oh my gosh, his lips are so cute and funny! Love it! How stinkin' adorable are those little doggies? I used the photo on this layout to step out of the box a bit. Although these are summer papers, they matched perfectly with my winter photo. The colors are an exact match to Donovan's Spongebob hat! Did you notice that the colors of the 2 doggies match the colors of the boys' coats? I'm finally getting around to posting this layout. 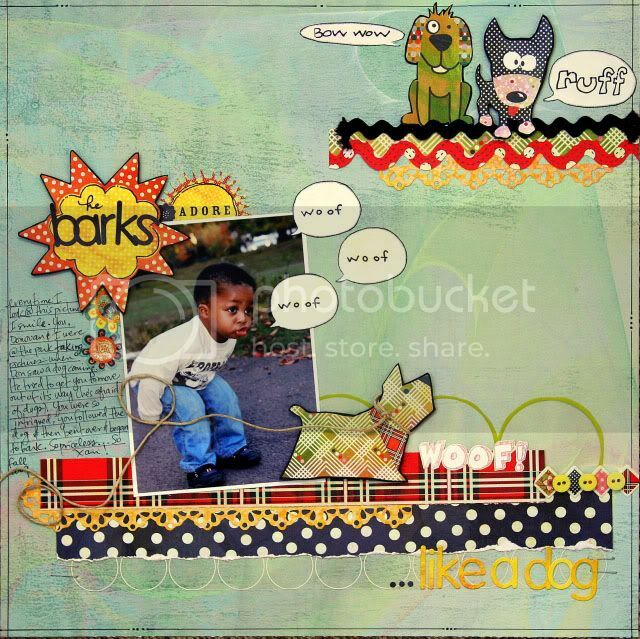 I created it about 2 months ago to teach at my local scrapbook store last month. I love it when I find really cute masculine papers! 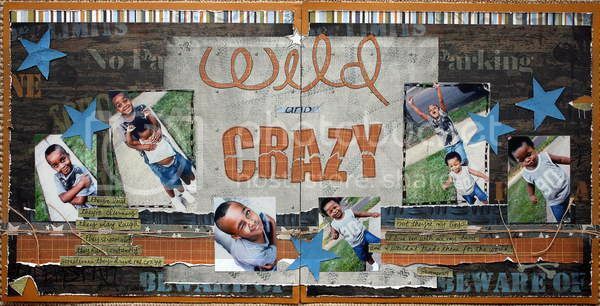 This line, Urban Ink, by Dream Street Papers was just begging to be torn and distressed and were just too perfect for these photos of my "wild and crazy" boys! I cannot even begin to tell you how purely thrilled I am to announce that I'm going to be teaching scrapbooking classes aboard a cruise next year!!! My stomach is doing flip flops of happiness...I could just burst!!! Want to know what will make me even happier? Getting the opportunity to see some of my online scrappy buddies on that cruise!! We would have such a crazy fun time and Croptopia Getaways knows how to throw an awesome crop!!! I just returned from their cruise a few days ago and let me tell you...spoiled is not the word! All of the cruise details are in this post! If you decide to join us, just let them know I referred you, OK!! Format of Event – based on your feedback, we are thrilled to announce that this cruise will again be a project based cruise! 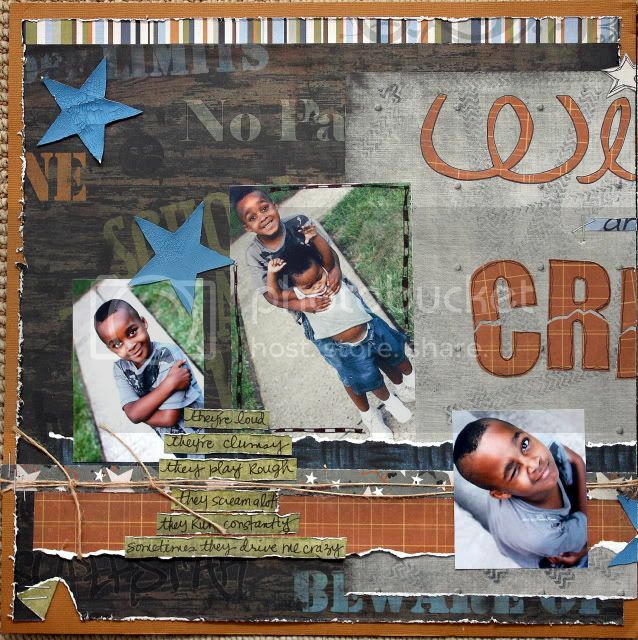 We’ll have a full schedule of classes, mini workshops and make & takes so there won’t be a need for you to lug all your scrapbooking supplies UNLESS you would like to use the open studio time each evening to crop. The schedule will be very similar to this year’s with the exception of one mini project each evening after dinner and then we are going to invite you to enjoy the shipboard activities with us (or of course you can take advantage of open studio time if you wish!) Sharon and Lisa from Right At Home will have a “Supply Bag” that you will be able to pre-order and in it will be all the products you will need for the week so you COULD come aboard with just your clothes if you wish. Details on this will be forthcoming. We hope to see you all next year and don’t forget about our land event at the Hanover Marriott in Whippany, New Jersey March 26-28…. 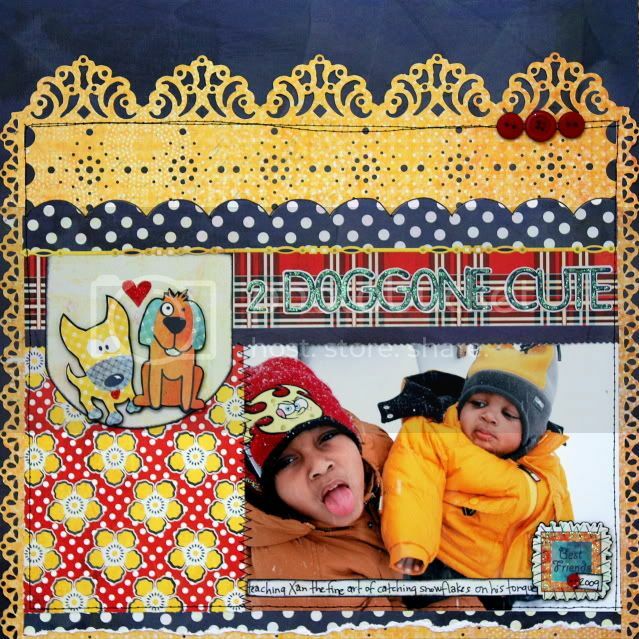 Guest Instructors: Tanisha Long, Right at Home Scrapbooking and Cara Miller. Bonus: $50 per cabin shipboard credit to spend as you like! *Platinum members deduct $50 per cabin for balconies, Diamond members deduct $100 per cabin for balconies. Pricing for single supplement, triple/quad occupancy available. Alternative cabin categories available, contact us for pricing. Non-scrapbooking family and friends may deduct $200. Deposit: $100 per person due with registration. 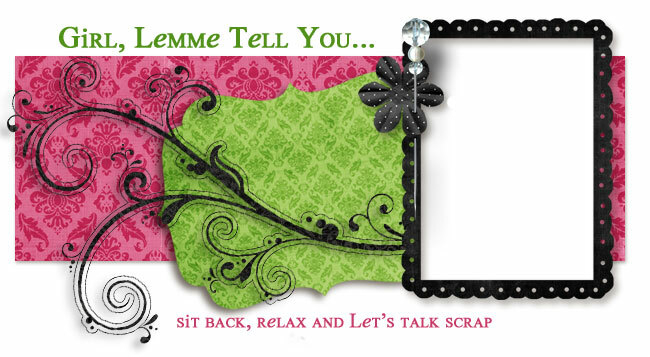 $200 Scrapbook Fee payable to Croptopia Getaways prior to 7/15/10. Final payment due on or before 7/15. 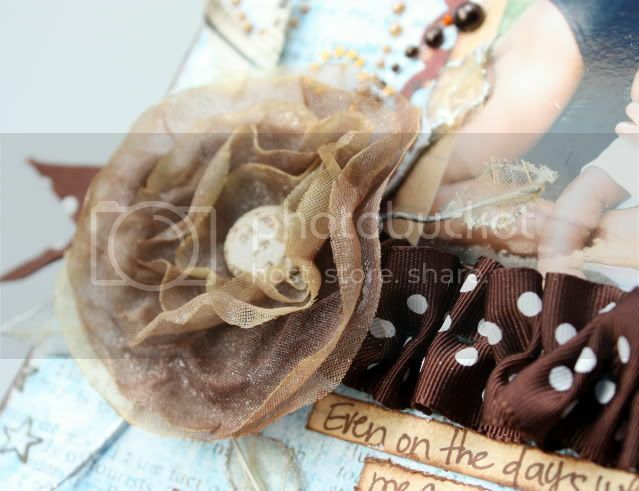 It gives me great pleasure to share these next few projects that I created with Timeless Daydreams's debut kit. For as long as I have known Dolores, she has talked about having her own kit club and now she, along with her good friend Michele have made it happen!!! I am so proud of her and excited to have been asked to create some projects with this month's kit. 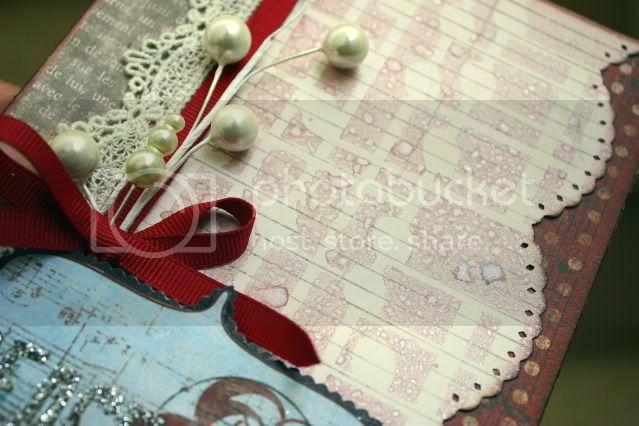 This kit is incredibly gorgeous and is packed full with scrappy goodness. 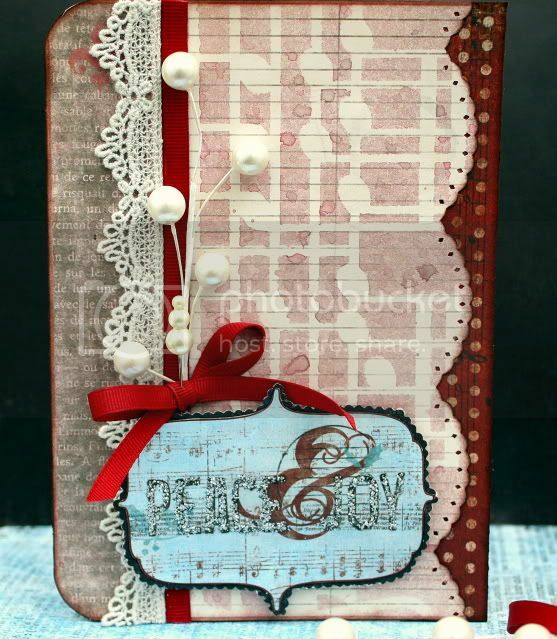 It features Pink Paislee's Mistletoe & Co and lots of Prima...what a beautiful combination. 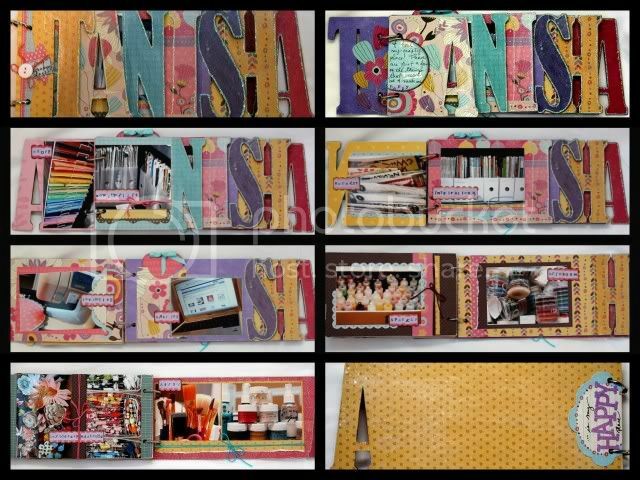 The contents of this kit surely lit a fire in my mojo; I created 3 layouts (2 of which can be seen in this post), 2 cards and a mini album. I put my Shimmerz Paints to work on these projects! 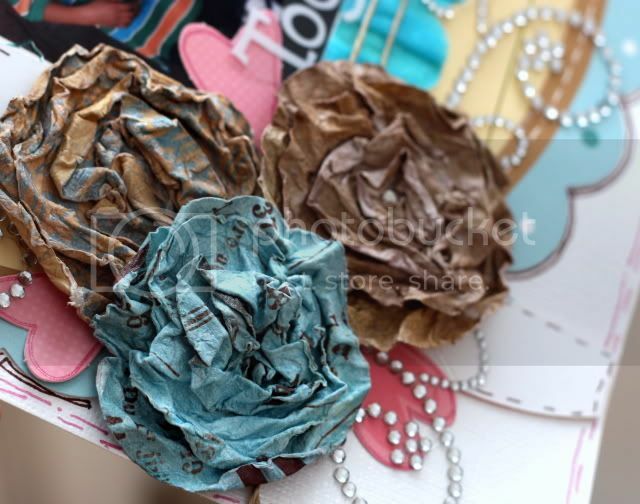 I created the flower on this card from a piece of music paper. 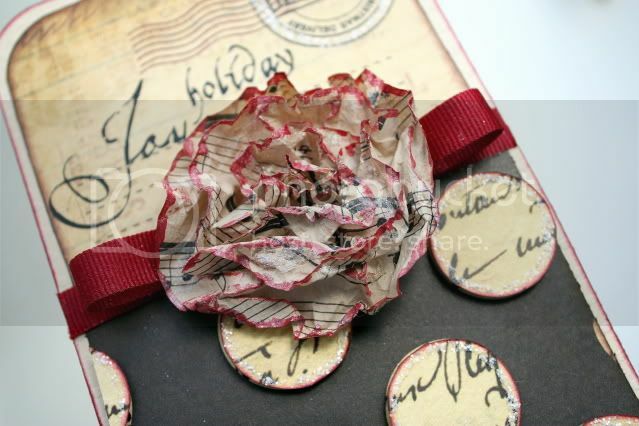 I sprayed it with baby's breath shimmers, crumpled it and then dried it with my heat gun. I wanted to incorporate more red, so I painted the edges of the flower with royal red shimmerz. To add a little more sparkle, I swiped a little gold glimmer blingz inside the petals. I also sprayed the ribbon with baby's breath spritz, a girl can't have too much sparkle! 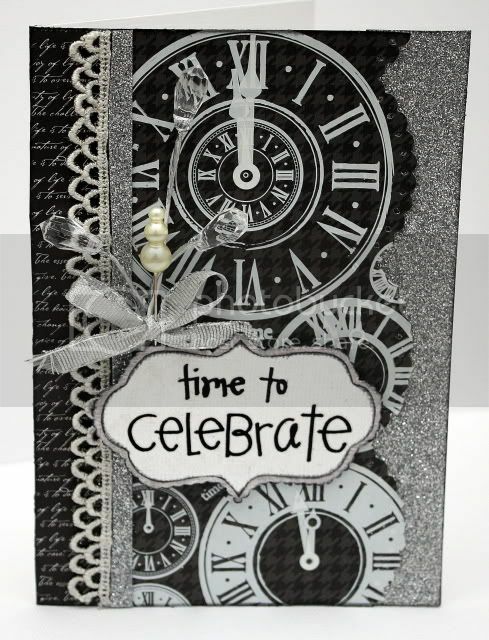 To add dimension to the card, I layered the circles using pop dots. Before adhering them, I inked the with maroon clearsnaps chalk ink. I then added rock candy stickles around each circle! The great thing about this line of Pink Paislee papers is that you can use them for topics other than Christmas. The red, white, and blue color scheme could easily be used on a Fourth of July project. Donovan was Captain America for Halloween--I contemplated using those pictures here. I ended up creating a sweet layout about me and my boys. journaling: Of all the names I've been called, I think I like "mommy" the best. Even on the days when the boys have driven me crazier than crazy. Even when they've called my name 1,673,219 times on any given day. Even when I tell them I'm going to change my name to something they can't pronounce. Every time I hear it, it reminds me of the unconditional love that we share. So although I joke about changing my name, I wouldn't do it for anything in the world. 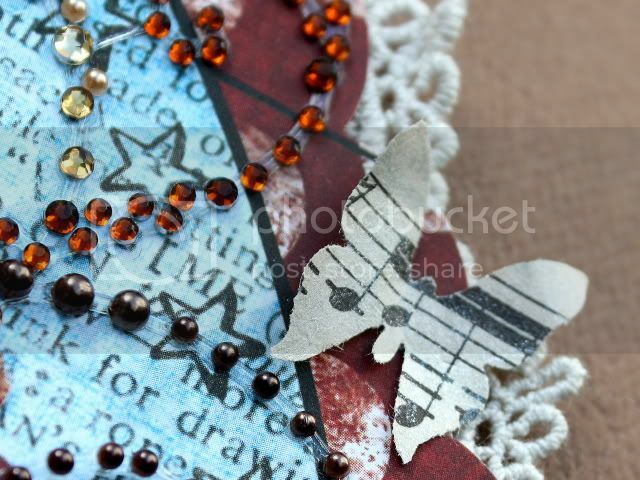 I punched the butterflies out of the music paper and sprayed them with baby's breath shimmerz spritz. I used some baby's breath on the flower, too. 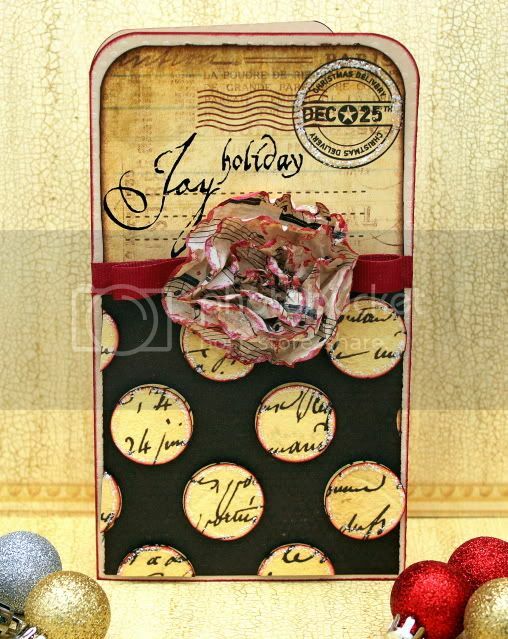 I used the 7 Gypsies card included in the kit to create this card. I used a mask and barn door shimmerz to create the background. The blue postcard was a little too bright for the tone of this card, so I sprayed it with Treasured Hymn spritz to antique it a bit. I traced the sentiment with rock candy stickles and sprinkled a little silver glitter on it before it dried. 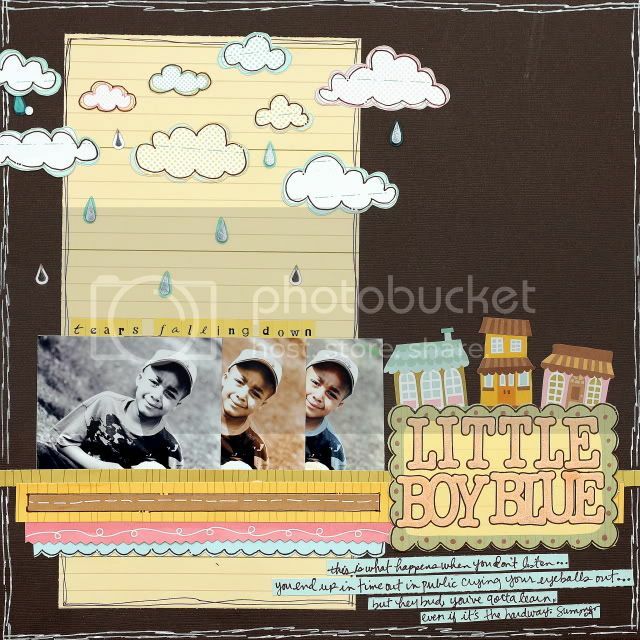 This mini album was so fun to create! It's all ready for the photos I plan to take during the upcoming holiday. 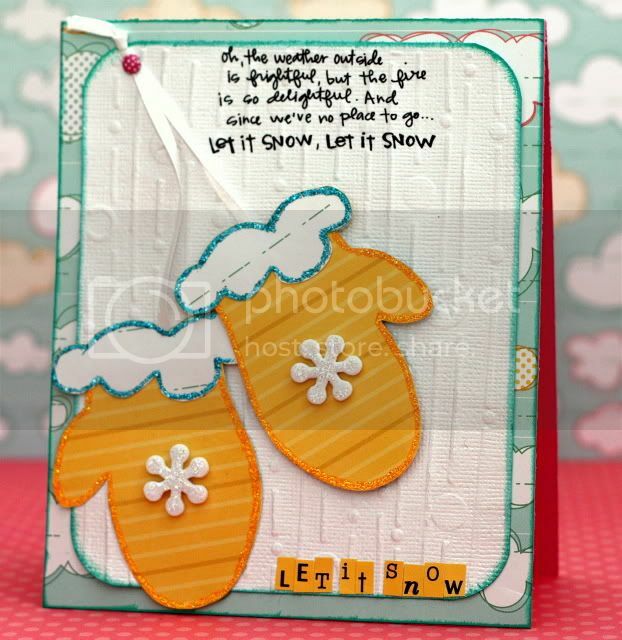 This card was created using Bo Bunny's Snowy Serenade. I literally took me about 5 minutes to put this card together. The paper is so beautiful that all the work is done. 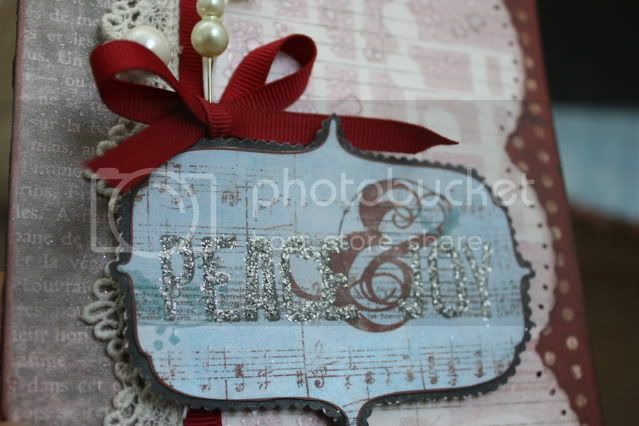 All I had to do was add ribbon and a punched border strip.